“It would be the only instance of rewarding distance in sports,” Eddie Gottlieb, NBA rules consultant, told a Philadelphia Inquirer reporter in the summer of 1979. The league was about to add the 3-point shot for a one-year trial run. Anyone who has been to a track meet knows that’s not true, and one of football’s building blocks, the first down, is all about distance, but Gottlieb, a hall-of-fame coach and owner of the Philadelphia (now Golden State) Warriors had a point to make. The bonus ball was great for a fast and loose league like the ABA, but it had no place in the traditionalist NBA he helped build. Gottlieb was wrong, of course. The 3-pointer wasn’t a gimmick. Outside of maybe the addition of the shot clock, there hasn’t been a more revolutionary rule change in basketball. NBA teams attempted 2.77 3-pointers per game during the regular season that first year. This year teams attempted an average of 27 per game. The Houston Rockets, the highest-scoring team in the league with noted advanced-stats advocate Daryl Morey as general manager, attempted 40.3 3s per game. You say you want a revolution? 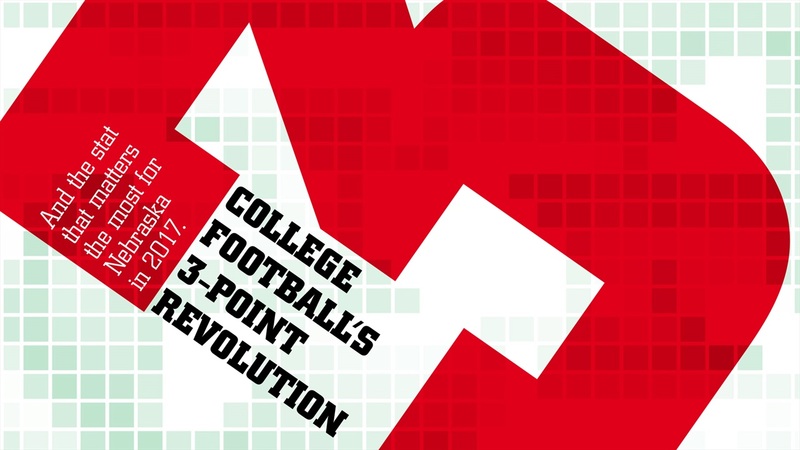 That’s what a revolution looks like, and, though it’s not the direct result of any rule change, college football has its own 3-point revolution on its hands. It’s a big part of the reason why new defensive coordinator Bob Diaco is the highest-paid assistant in the history of Nebraska football. 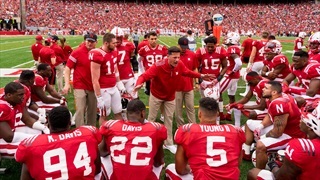 Aaron Babcock Defensive coordinator Bob Diaco offers instructions to the Blackshirts during Nebraska's spring game on April 15, 2017. 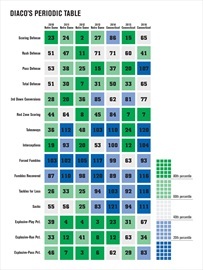 The NCAA football record book doesn’t start listing national averages for major statistical categories until 1937, but what’s there is enough to get a pretty clear picture of the evolution of football. Offense plays a slightly larger role every season. Points and yards and plays tick up slightly each year. What constitutes good defense is constantly being redefined. The real point of no return came in 1978, perhaps the height of Wishbone football, when the average Division I team ran the ball 50.9 times per game, attempted 21.2 passes and scored 20.8 points. Last year the average offense rushed 39.8 times per game, passed 31.7 and scored 30 points per game. Amazing what 10 more passes per game will do. It’s not the act of passing itself that matters, but what those passes achieve on average – more yards. That was in response to a reporter’s question following Nebraska’s 10-3 win over Oklahoma in 2009. The Sooners outgained the Huskers 325 yards to 180, ran 30 more plays and had 16 more first downs. Based on those numbers, Nebraska should’ve gotten waxed, but this wasn’t quite the odds-defying victory one might think because Nebraska won two key categories. One, it intercepted Oklahoma quarterback Landry Jones five times, and, two, it was even in explosive plays. And that was a toxic combination for the 20th-ranked Sooners. In fact that’s what former Baltimore Ravens head coach and Super Bowl champion Brian Billick decided to call his stat that combined turnover and explosive-play differential – the toxic differential. It’s already a fixture in nerdy NFL circles, but has been slow to catch on in the college game, even if almost every coach is paying attention to it, whether they know the term “toxic differential” or not. “I still think turnovers and explosive plays make the biggest difference in winning the game,” Mike Riley said at one of his press conferences last October. That’s a reasonable line of thought because both, while not points themselves, lead to points at an increased rate. Every coach has his own definition of what makes for an explosive play. Some say any gain of 20 yards or more qualifies. Others, like Riley, weight things and say a run of 10-plus yards and a pass of 15-plus yards are both explosive. However you choose to chop it up, those plays, while just yards, are almost as good as points. According to 2008 research from current Seattle Seahawks Coach Pete Carroll, NFL drives that included an explosive play resulted in points 75 percent of the time. Preventing the big play was the number one point on his defensive philosophy chart at USC. I found similar numbers in 2015 at Nebraska. The Huskers’ offense scored on 42.2 percent of its drives that season, but 80.7 percent of drives with an explosive play ended in points. The turnover numbers as they relate to points aren’t quite as stark, but they’re still notable. In 2015, Nebraska’s offense scored on 58.3 percent of its drives coming off a takeaway against the same 42.2-percent baseline. And that’s not even factoring in the potential for points prevented by the takeaway itself. So what does a coach do with that information? Which brings us to Diaco. Force turnovers, defend the big play. Historically his defenses have been very good at one of those things. Mark Banker’s 2015 defense wasn’t a total disaster. The Huskers ranked ninth nationally against the run and 24th in third-down defense, but that unit had a few fatal flaws. It ranked 105th in takeaways and gave up an explosive play (20-plus yards) on 8.7 percent of its total snaps (119th nationally). The Blackshirts made gains in both categories in 2016, climbing up to the middle of the national rankings, but it wasn’t enough to save Banker’s job. So here we are at the beginning of Nebraska’s Diaco period. Create a heat map based on national rankings of his past seven defenses (four as the defensive coordinator at Notre Dame and three as Connecticut’s head coach), and some patterns emerge. His defenses have traditionally been good at keeping points down, and they’re usually better against the pass than the run. They get off the field on third down and stiffen in the red zone. The thing Diaco’s defenses are best at, however? Defending the big play. His first defense at South Bend ranked 39th nationally in 2010. Things only got better from there as Notre Dame ranked fourth, fourth and third in explosive-plays percentage the next three seasons. Even his Connecticut defenses were pretty good, minus last season when the Huskies had to replace 10 starters on defense. It’s a great way to play defense, which might seem like an obvious point. It has always been good for a defense to avoid giving up 20 yards at a time the way it has always been good for an offense to pick up a first down. But the difference with Diaco is that it might be the founding principle of his entire defensive philosophy. That’s the passing side of the equation and Diaco’s last three Notre Dame defenses finished seventh, third and seventh nationally in explosive-pass percentage. The same philosophy also applies to stopping the run, where Diaco’s Irish teams never finished worse than 35th nationally. Now think about 3-pointers again. I guess, technically speaking, the field goal is college football’s 3-pointer. But practically speaking, it’s the explosive play. It’s changing the way people think about football the way the 3-pointer has already changed how basketball is viewed. Nearly 40 years ago, the 3-pointer was a “gimmick.” Now it’s the foremost weapon in the game and teams like the Rockets that are really willing to push the strategy dictated by analytics might still have an edge, though it seems to erode a little bit as trend-setting thinking simply becomes the trend. We many not be quite there yet with explosive plays and football, but we’re getting closer. How often did you hear the term explosive play 10 years ago? And how often do you hear it today? Assuming points and plays and yards (especially the explosive ones) continue to increase a little each year, the teams best capable of defending the game’s best weapon are those that should have the most success. Diaco’s advantage is that he’s been standing on that corner longer than most. Aaron Babcock Wide receiver Stanley Morgan Jr. looks back during a 72-yard touchdown reception against Indiana in 2016. The preseason predictions for Nebraska haven’t been kind. ESPN’s Football Power Index projects 5.5 wins for the Huskers in 2017. SB Nation’s S&P+ system calls for six wins. It’s easy to distrust random numbers like that out of context, but they don’t come from nowhere. Nebraska has to replace its quarterback, top running back and three of the top four receivers from an offense that only averaged 21 points against Big Ten opponents. There’s also the behind-the-numbers notion that Nebraska was about a seven-win team that won nine games in 2016. Finally, there’s a new defense, too. Keep a close eye on how many big plays the Blackshirts are allowing in 2017. We know preventing those plays is really the strength of a Diaco defense. Combine that with what Nebraska returns on that side of the ball and it is reasonable to expect improvement in this category over the previous two seasons. We also can surmise based on the data that this one sliver of football becomes incrementally more important with each passing season. As far as growth opportunities for the Huskers go in 2017, this is the biggest one. Better quarterback play and “fit” offers the potential for some nice returns on offense, but not as great as limiting explosive plays defensively. Part of the reason it’s so important is based on what Diaco’s defenses haven’t done well. If you looked closely at the heat map, you may have noticed a bunch of low national rankings in the takeaway categories. You could consider that part of the philosophy, too. Billick called his toxic differential a case of risk versus reward. If a defense wants to sell out in the pursuit of takeaways, it can. Those are game-changing plays. But if it comes at the expense of giving up more big plays, that defense may be giving up more than it’s getting. The inverse could also be true. A defense could be so guarded against the explosive gain that it doesn’t force enough turnovers. But there’s one key difference when looking at the equation that way. All of the research on turnovers in football indicates that they are random. Every coach makes a point of teaching players to value the football on offense and to try to get it back on defense, but there’s nothing to suggest that the coaches can reliably influence how good or bad it is at forcing or avoiding turnovers. Flip a coin long enough and eventually you’ll end up with a sample that’s about 50-percent heads and 50-percent tails. A football skipping along the turf isn’t much different. At some point the prolate spheroid is going to bounce however a prolate spheroid bounces. Some years a team will be lucky. Other years it won’t. But a coach can control how he builds his defense. He gets to choose what he hopes to take away from the opposing offense and how he goes about teaching that philosophy to the team. If you buy Billick’s assertion that toxic differential matters and were then charged with applying it to a football team, would you choose to focus on the part that you might be able to control or the part you almost certainly can’t? The choice seems pretty clear. And toxic differential definitely does matter. Over the last seven seasons of college football a high ranking in this stat has been positively correlated with a high ranking in winning percentage. Of the top 10 toxic-differential teams between 2010 and 2016, seven of them also ranked in the top 10 in winning percentage and that correlation carries pretty strongly throughout the rankings. Kansas is the worst toxic differential team of the past seven seasons. The Jayhawks also rank last in winning percentage. The Huskers occupy an interesting spot in both rankings. Nebraska ranks 60th in toxic differential per game over that span, which is dead average. Yet the Huskers have the 22nd-best winning percentage in those years. That gap of 38 spots in the two rankings is the largest in college football. No team has won a greater percentage of its games with a worse ranking in toxic differential. There are two basic ways to think about that. You could look at it and think the Huskers have been fortunate to win as many games as they have over the previous seven seasons. Or you could look at it and wonder what things might be like if Nebraska’s toxic differential improved. How does it improve in 2017? There are four variables in that equation, two on each side of the ball. The Huskers’ offense did a good job of avoiding turnovers last year (12th nationally) but needed some more explosive plays (87th). Defensively, Nebraska could do with some improvement in both categories. But it can only really control one of those things. Diaco has made a career out of controlling that one thing. This story originally appeared in the 2017 Hail Varsity Yearbook. Don't have a copy? Subscribe today.